Experience the spectacular mountain scenery of the Zahmer and Wilder Kaiser mountain ranges. Realise your own personal adventure and wander through the Kaisergebirge and along the Kaisertal on this moderately difficult hiking route past impressive sheer rock walls – the classics in the history of climbing! This tour is suitable for experienced and sure-footed mountain hikers who possess the required condition for the given walking times. After a stress-free journey by rail & bus to Ebbs (475 m), alight at the "Postamt" bus-stop and walk along the high street for about 100 m and turn into the Kaiserbergstraße between Oberwirt tavern and the church. Follow the street for about 1km, at first through the town towards Aschinger Alm, and uphill until you reach a cattle grid (sign: "Vorderkaiserfeldenhütte"), then about 800 m of winding asphalt road to a signpost. The hiking path begins here, which crosses a forest track twice and leads via the "Musikantenrast" to the impressive, rugged rock faces of the Zahmer Kaiser. Now wander along the foot of the rock face, partially somewhat exposed and steep, towards the southwest to the Vorderkaiserfeldenhütte (1388 m). If you wish, you can refresh your floral knowledge in the Alpenpflanzengarten (Alpine garden) or take a side trip to Naunspitze (1633 m, barely 1 hr). You could however simply enjoy the breathtaking views from the hut’s terrace towards the peaks of the Wilder Kaiser and across the whole Alpine chain. Within the hut’s cosy atmosphere in its rustic dining rooms you will be indulged by Sabine & Helmut with local specialities. The high trail No. 811 branches off just below the hut towards Stripsenjoch. It initially runs quite flat, and then sloping slightly upward later but it always leads beneath the jutting rock spurs of the Zahmer Kaiser’s southern side. At the foot of the Vordere Kesselschneid peak, the path branches off to the left at a small patch of scree towards the Pyramidenspitze. The path leads uphill directly beside the hut and through a sparse mountain forest towards the Naunspitze and after about 30 mins. through patches of low, shrubby mountain pine to the Petersköpfl (1745 m). A magnificent summit tour begins here via Einserkogel (1924 m) and Zwölferkogel (1912 m). After the descent through a short gulley called the Vogelbad (birdbath), you will come via the Elferkogel (1916 m) to the Pyramidenspitze (1997 m). Once again descending, to the southwest until you meet up with the high trail to the Stripsenjochhaus. The two paths meet here and after a few minutes to the east you will reach the so-called Kaiserquelle. Now traverse the mountain-pine-covered slopes and the patches of scree below the Kaiser rock-faces and you will reach the Hochalm (1402 m) and walk further in a southerly direction across the Feldalmsattel to the Stripsenjochhaus (1577 m). 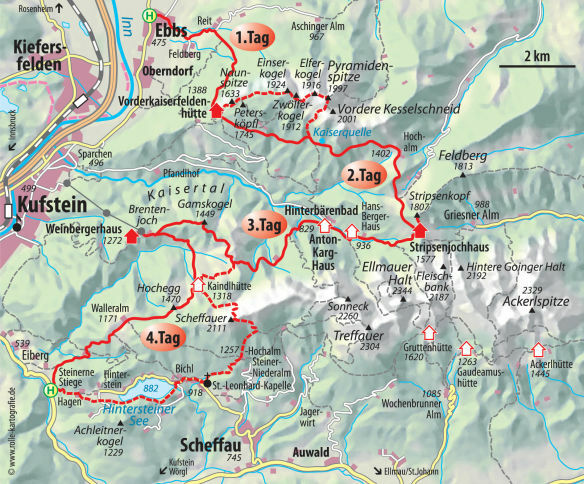 If you wish, you can walk up the Stripsenkopf (1807 m) in about 1 hour. You can spend the evening and the night at the Stripsenjochhaus, and be entertained with Tyrolean specialities from landlord Christian Fankhauser and his team. Invigorated by the breakfast at the "Strips" hut, the tour leads westward in serpentine curves downhill into the Kaisertal and to Hinterbärenbad (829 m). You can fortify yourself here with a short break in the Anton-Karg-Haus for the upcoming ascent. The "Bettlersteig" path leads directly from the house moderately steeply upward at first, and crosses a number of ravines bringing you in ever steeper winding curves (with ultimately two short sections with cable handrails to a height of 1356 m. Walk from here to the right to the Gamskogel (1449 m) and then further to the Weinbergerhaus (1272 m), your abode for the third night. Along with a fantastic view over Kufstein and the River Inn valley, Tobias and his team will provide you here with that special extra touch of their Tyrolean specialities to make your day perfect. After a hearty breakfast, the trail at first leads you over to the Kaindlhütte. You have two options here according to your condition and sure-footedness. At the first fork in the path follow the trail up to Hochegg (1470 m) and from here it is all easy downhill hiking via the Walleralm and Reher downward to the Steinerne Stiege (bus stop). On a path going southeast you will at first pass through a wood and up to a cirque below the Scheffauer north face. The Widauersteig begins here, which is not fully secured (via ferrata equipment and a helmet are recommended!). It leads to the peak ridge of the Wilder Kaiser and further to the Scheffauer (2111 m). After enjoying the dizzying heights on the summit, climb back down to the col, and down from here to the south. After about 1.5 hrs. you will reach a fork in the path at which you turn right to the Steiner Hochalm (1257 m). Here at the Steiner Hochalm follow the signs to Bärnstatt/Hintersteiner See. In barely an hour at St. Leonhard’s chapel and the Bärnstatt tavern you will see an asphalt road. Turn right along it and after a few minutes you will reach Café Seestüberl in Bichl on the Hinterstein Lake. There are two ways of hiking round the lake: either on the south side of the lake along the picturesque lakeside path, passing the eponymous Hinterstein to Hagen, or on the north side of the lake following the road through Hinterstein to Hagen. Both paths meet up here again. From here, follow the signs to Steinerne Stiege, and follow it steeply down until you come directly to the "Steinerne Stiege" bus stop on the federal highway to Kufstein. Please note: All DAV-maps can be purchased at our service-points in Munich , located in the Globetrotter at Isartor, in the Sport Schuster at Marienplatz or the DAV Kletter- und Boulderzentrum in Gilching. Take the bus 4030 from Kufstein Station to Ebbs, Station Postamt.